Conclusion: In this experiment, we measured the temperature of two containers of soil; one container was composed of the original soil and the other container was formulated of carbon dioxide (CO2) along with soil. My original hypothesis was based upon the idea that the soil diffused with Carbon Dioxide would have a higher temperature throughout the 500 seconds of the trial. My data did not support this claim as the soil without CO2 increased at a faster pace with the light reflecting onto the substance. The soil with carbon dioxide decreased at a higher velocity than the regular soil as the light turned off. These results occurred because while the thermal energy reflected from the sun lamp, the container filled with carbon dioxide trapped the heat in the gas, allowing less heat to travel into the soil. While the container composed of soil alone received the heat directly from the sun lamp causing a greater increase. As the light was turned off, the heat trapped in the gas released into the soil where it gradually diffused causing the temperature to decrease at a slower pace. The other container didn’t have any leftover heat as it did not contain carbon dioxide or any gas. The soil’s heat began to decrease at a faster pace as it was adapting to the room temperature. 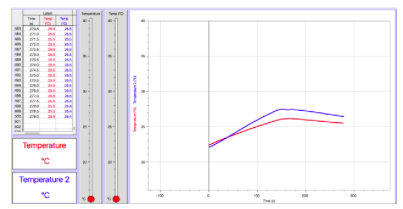 These results are shown in the graph below as the blue line shows the growth of the regular soil increasing where it later decreases at a faster pace than the red. At 484 seconds the carbon dioxide diffuse soil had a temperature of 25.5 degrees celsius. The regular soil had a temperature of 26.5 degrees celsius. This data shows the slower decrease of the carbon dioxide filled soil. Evaluation: During this experiment, we encountered a problem which affected the reliability of our analysis. The scaling of our graph became a complication in the trials, as it affected how we viewed the data. It was difficult to find problems during the experimentation as the program used to make the graph was unable to scale the graph as we would have hoped, which made it hard for us to see errors and growth patterns. In the future, to ensure that we can analyze our data to the fullest extent, we will attempt to use Logger Lite (the program used) prior to the experiment; on both partner’s laptops. I would like to follow up this experiment by using a different gas such as water vapor or methane that both are in our earth’s atmosphere and contain heat. I am interested in seeing any differences that may occur with this trial and the future trials.